Today is a day of Thanks to all the men and women who have signed at the dotted line on a blank check payable up to their lives. 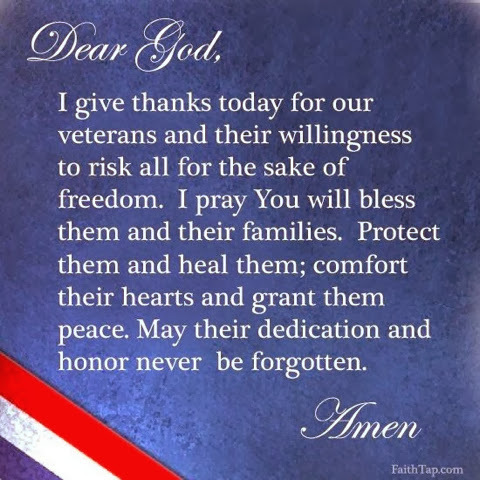 I will thank every Veteran I meet today (as I do everyday) with sincere appreciation. 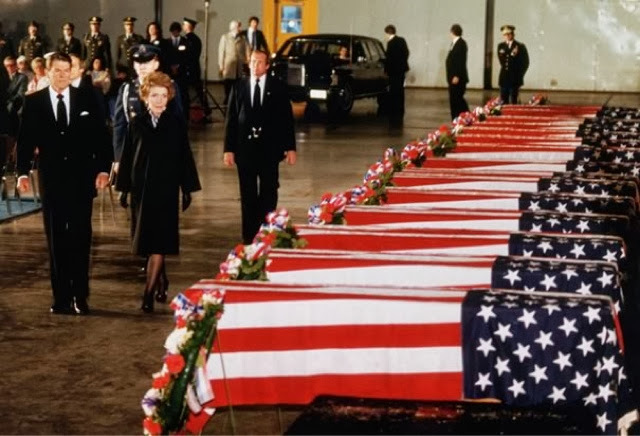 Thirty years ago on October 23rd in Beirut, Lebanon 241 US Troops were killed when suicide bombers drove trucks loaded with explostives into the Marine Barracks. Remember... Their Sacrafice. Our Freedom. 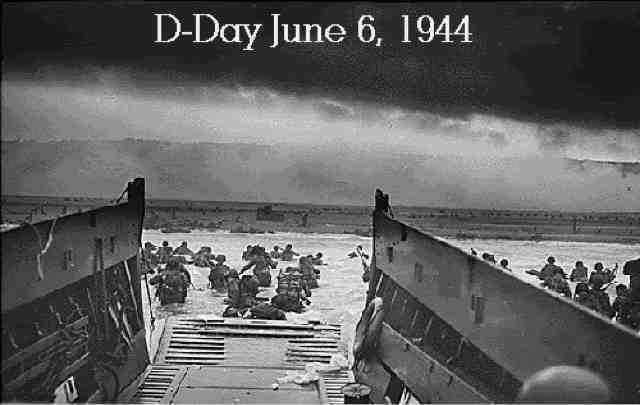 June 6, 1944 is an important day in history. It is a day of honor and courage. I encourage you to read some of the amazing stories that will be retold today. Remember... Their Sacrifice. Our Freedom. The world lost another piece of history when Frank W. Tomberlin, a Pearl Harbor survivor passed away at 92 years of age, his wife, Louise of 66 years was at his side. Mr. Tomberlin joined the Navy in 1940 and was stationed in Pearl Harbor on the destroyer USS Henley when the Japanese attacked. He continued to serve on the Henley until October 3, 1943, when it was torpedoed and sunk off the coast of New Guinea. Mr. Tomberlin finished his service on the USS Lyman K. Swenson until he was discharged after the end of the war in the Pacific. On April 17, 2013, the Lassen County Board of Supervisors passed a proclamation honoring the last of the Lassen County Pearl Harbor survivors, Frank W. Tomberlin and Richard "Pappy" Dallimore. Pappy Dallimore is now Lassen County's sole survivor. Mr. Tomberlin enjoyed spending time with his children and 20 grand-children. He was an avid 49'ers fan and loved animals. The family requested in lieu of flowers at the memorial service, they would like everyone to, "Please tell a Veteran, Thank you for your service." 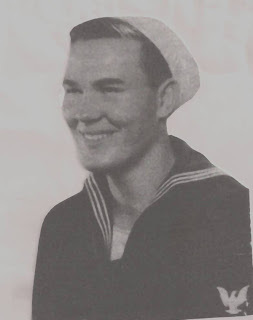 I ask my readers to thank a Veteran in honor of Frank W. Tomberlin, Pearl Harbor Survivor. I was contacted by a reader about something GREAT! A team who represents the 7th Special Forces group, made up of Operational Detachment Alpha Underwater Operations Team members are honoring a fallen teammate. SGT Timothy Padgett who was killed during combat operations in Afghanistan six years ago this May. How are they honoring SGT Padgett's memory? After being home from an Afghanistan deployment for only SIX weeks, they will be competing in the Eglin AFB Gate to Gate run. The Gate to Gate run is 4.4 miles and is to take place on May 27, 2013. A traveling trophy will be awarded to the first team in the military division, and these guys WANT this trophy, as they run in SGT Pagett's memory. Winning the trophy in memory of SGT Pagett's isn't enough, after all he selflessly gave his life for his teammates and his Country. The team wants to help the families of their fallen brothers by collecting donations for the Special Operations Warrior Foundation. The Foundation provides college scholarships in addition to other programs for the surviving children of fallen Special Operations Forces members. The Team's goal is $10,000 and they are only 42% of the way there with 29 days left. This is good news, because there is still time for You to make a donation! Gina Elise from Pin-Ups For Vets (http://www.pinupsforvets.com) and Words For Warriors are looking for sponsors to support a moral boosting visit to the Reno, Nevada VA Hospital. Pin-Ups For Vets is a non-profit organization which supports it's visits to VA hospitals, military bases, and active duty military on the home front and overseas through the sale of 1940's inspired pin-up calendars. Gina is a super hero in the military support sphere, her accomplishments have been reported by Inside Edition, ABC, NBC, Fox News, American Forces Network, Good Day LA, Desert Car Kings, The Washington Times, Boston Herald, The Denver Post, and Stars and Stripes. Did I mention she is beautiful and sweet with a heart of gold too? "Pin-Ups For Vets raises funds for medical equipment and program expansion to improve Veteran's healthcare, enhances quality of life for ill Veterans across the U.S. through personal bedside visits to deliver gifts of appreciation. promotes volunteerism at Veterans Hospitals, conducts morale-boosting events for military spouses, and boosts morale for deployed troops through delivery of care packages." I am struggling with the decision to continue this blog, or call it quits. Don't get me wrong, I am still a huge supporter of Military, Veteran's, Wounded Warrior's, and their Families. Providing support has introduced me to some amazing people. At the same time, it has opened me up to nefarious military personal who lied to me in ways I still can't comprehend. So I ask, is this blog reaching it's intended audience? 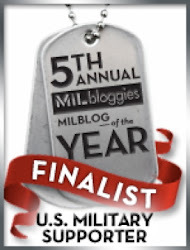 Does publicly showcasing support for the Military help in anyway? Should I change the blog's scope? Be honest. I'm asking for it. Above all though.... Remember. Their Sacrifice. Our Freedom. On this Thanksgiving Day I am lucky enough to be with my family. We are all healthy and happy. There are many service members who are far from their family, whether they are deployed protecting our freedom, or recovering from an injury in one of the many hospitals and rehab facilities. Children at Janesville Elementry are always excited to know their work has ended up in the hands of a service member, as they are closely related to super heroes (according to one little girl). This year several teachers coordinated letters and artwork for Veteran's Day and Thanksgiving. I have asked a wonderful and strong wife of a wounded Marine to take the student's appreciation to the San Diego hospital and deliver them on my behalf. Seeing the hard work and the great pictures these students made for services members brings happiness to my heart. Every time I see one of the children, they want to know all about who got their artwork and letters, and if they like them. I hope I'll have some pictures to share with them soon. I hope to share the smiles they have brought to our Wounded Warriors. I have been thinking a lot over the last six months about Hope and Thankfulness. The economy, politics, and life in general has thrown some vicious curve balls my way over the last two years. November is a symbolic month for reflection and thankfulness, or at least it is for me. It is also the beginning of the holiday season to celebrate family, friends, and life. I have lost most of the people I love to cancer, so the holiday's for me are a time of nostalgia, memories, and hope. Hope and Thanksgiving go hand in hand; for the people who have the most hope, are by nature the most thankful. The people who have endured the biggest challenges, who have lost the most, they are the people who know how to be thankful for the simple things. In a time of the "Give It To Me" generation, coupled with the Constitution being trampled on an hourly basis hope may seem futile. As much as there is cause for fear, there is still hope. Hope that a leader will emerge who can turn our Country around. Hope that the young will learn to take responsibility for their actions. Hope that American's will take pride in themselves, in their Country by using their purchasing power, their representatives to demand change. History has many valuable lessons. The most important lessons are, work hard, do the right thing, even when it's hard, and be thankful. I am Thankful for many people, events, and experiences (good and bad) throughout my life. As much as I miss those who are no longer with me, I am grateful for the time I spent and the memories I have to hold onto.